ReVision II finally left the Society Islands on Tuesday much to the disappointment of Captain and Crew. We are having a good sail so far and are heading towards Apia in Samoa. We are keeping a close eye on the weather which has been somewhat variable of late but so far we have had clear skies and steady winds. We hooked three fish today, firstly a huge sailfish which got free after a brief fight, then we managed to get a large Wahoo to the side of the boat but couldn't gaff it but finally we managed to land a nice Tuna of 8-10lbs which Carolyn is currently preparing for dinner tonight. The moon is full at present and is almost bright enough to read by so night watches are proving more popular than normal. 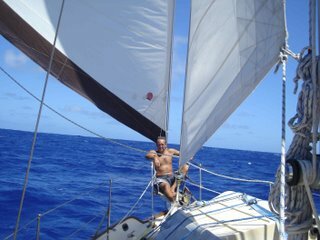 At 0430 GMT on Thursday 7th September ReVision II was at 15 deg 59 mins South and 154 deg 54 mins West and we have 986 miles to go to Apia. More later. ps just heard from another boat on passage that hooked a whale today but couldn't land that either !